The Nielsen data makes up roughly 85% of all retail book sales but does not include e-book and preorders. "Considering two years ago Ryan was the VP nominee and a rising star, first week sales have to be considered fairly disappointing," said Pinter. "Ben Carson’s book is doing huge business, not just having sold 245,885 since publication in May, but it’s still selling over 11,000 copies a week and has a good shot at the #1 spot on the New York Times bestseller list in its 14th week in release." Paul Samuelson, a spokesman for Twelve Publishing, an imprint of Grand Central Publishing and the Ryan's publisher, told CNN they are happy with the sales of "The Way Forward." "Twelve is very happy with sales of The Way Forward," Samuelson said. "The Way Forward is a serious and important political statement and the conversation has just begun - we expect sales to continue well into the Fall election cycle. Twelve is honored and proud to be publishing Congressman Ryan who has been a wonderful partner to work with." Samuelson added that according to the publisher, Ryan's book has sold closer to 12,000 copies when you combine all sales, including digital. Ryan, who is considered a possible 2016 contender for the Republican presidential nomination, wrote the book to "challenge conventional thinking, renew the conservative vision for 2014 and beyond and show how it is essential for the well-being of our communities and the future of our nation," according to the publisher. Ryan did not receive an advance from the book, per House rules, but the eight-term congressman will receive royalties from sales. Since kicking off a book tour earlier this month in Philadelphia, Ryan has crisscrossed the country holding book events and speeches to tout "The Way Forward." In Chicago, he had his first public event with Mitt Romney, who chose Ryan as his running mate in 2012. Because Ryan is seen as a 2016 contender, his book will be seen as a gauge of his popularity heading into the national contest. When former Secretary of State Hillary Clinton published her latest memoir, "Hard Choices," earlier this year, a great deal of attention was focused on how many books she sold. Although Ryan outsold Clinton last week – 6,266 to 3,910 – the former first lady has sold 231,254 copies overall, according to Nielsen. Clinton's memoir also sold over 85,000 copes in its first week. Clinton's book landed atop the New York Times bestseller list when it was released in June, but her sales were considered poor because of the sizable advance she received, the attention around the book rollout and the fact her publisher reportedly ordered 1 million first edition copies. CNN reached out to a Ryan representative for comment but did not hear back. I'm wondering about Tom I's implication that he was ever "correct" in any of his posts. I don't recall that post. Can anyone remind me of a comment that he made on the ticker that was "correct"? TI is just another low-information reader of a low-information book. I find it amazing that there are actually 6266 Americans who want to re-visit their 1st-grade reader. isn't this where the koch brothers buy enough books to put it on the best seller list? ""My favorite is his claim to a sub 3 hour marathon time." My favorite is the photo op of kissing the fish he caught from a major lake here in Minnesota (of which he got the name of the lake wrong)." I'm partial to the incident when he stopped by some charity kitchen that feeds the homeless and proceeded to pretend to hand-wash dishes that had already been washed because he showed up so late. Plutocrat Pauly is as phony as they get. This was Sniffit's comment that Rudy is trying to pin on me. Sniffit is the one who gave inaccurate information and when Ol' Yeller demonstrated that I was incorrect on a post responding to it, I agreed that I was incorrect. You are very low man, Rudy. This is why people call you a liar. I see. In other words, when you admitted being incorrect to "Ol' Yeller" you were wrong. Yet, when I re-post your own words that makes me a liar? Nah, that's not it. You're just upset about how I re-posted your evolving position from wrong to right. Now that's what you're really upset about. And now you call me a liar for quoting you? How quaint.. I still believe his biggest mistake was claiming to know how to balance the budget when the OMB couldn't even evaluate his budget plan because his plan included using the $735 million saved by the ACA while at the same time repealing the ACA! There were also items in his budget with "details to be provided later" and never provided, so evaluating it was impossible. I guess most American don't care what a failed vice presidential candidate who couldn't even win his home state has to say. Imagine that. But ... but ... but ... Mr. Mittens had the momentum. You took the last word [post] away from him again. Now he has to reply all over again so that he has the last word. "You took the last word [post] away from him again. Now he has to reply all over again so that he has the last word." Oops! Maybe if I take WUPs advice and simply give him that much needed hug he and I can call it even ... ? 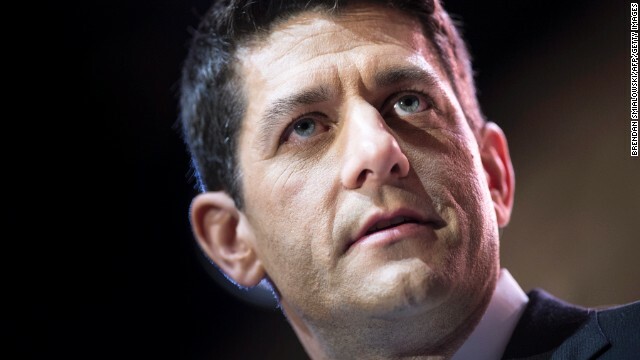 Paul Ryan: Looking like a evil villain in every picture is what I do. Nah, tom's ok, just needs to learn not to internalize everything and take it so personal, cuz it's really really not. This is an intertubez comment board. It is standard operating procedure for peoples to be nasty and ridiculous and throw pseudo-intellectual poop like angry monkeys and to sometimes go overboard, etc. You have to just learn to let it all roll off your back if you're gonna make a hobby of coming here (or anywhere) to post things. I find it often helps to spend some time just focusing on throwing poop at CNN in order to break any focus on whatever poop one of the other posters threw at me. Try it, tom, you'll like it...but make sure it's good, solid, substantive poop...not this "waaah, bias" crap everyone loves to toss. Dar, when the suspect is armed, police should not aim for the feet. However, what if the suspect is unarmed and more than 25 feet away from the officer?" Then they shouldn't be shooting in the first place. Can you come up with a scenario in which the suspect is that far away and unarmed and the cop (or someone else) is in immediate and imminent danger of being killed or maimed? Keep in mind, that's the standard, not that the officer is in "imminent danger of being disobeyed," which appears to be the standard they try to operate under in St. Louis. I dunno... 25 feet is less then 10 yards. NFL linemen can run 40 yards in 5 seconds or so. That gives an officer about a second and a half to make a life changing decision. It takes them close to 2 seconds in order to travel the first 10 yards in that 40 yard dash, too. Besides, if a police officer is so slow that 2 seconds is not enough time to make a critical decision during a pursuit, then he needs to be sitting behind a desk, instead of a steering wheel.